Under Bed Light: Dimmable Motion Activated Bed Light 5ft LED Strip with Motion Sensor and Power Adapter. Upgraded version 5ft, dimmable. You could choose your prefer brightness by turning the rotary knob on the motion activated sensor. With timer switch, lighting continued time is optional, 30s, 130s and 380s. Secrurity for baby with low voltage 12V, come with a power adapter in the package. 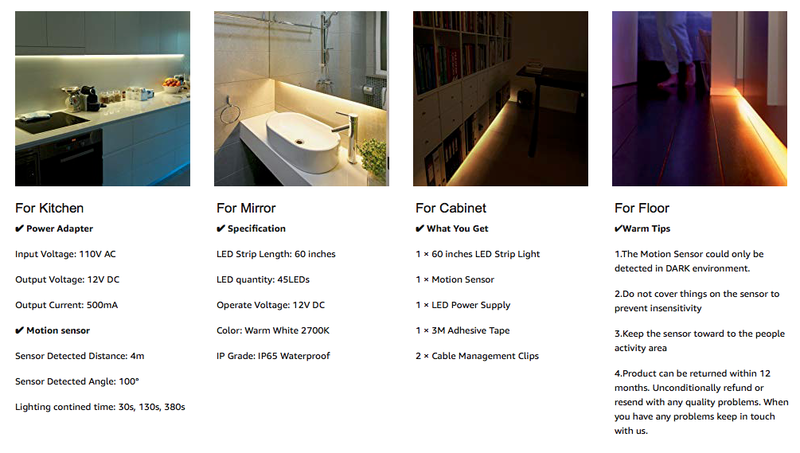 Warm White in Color Temperature 3000K, high CRI(Ra)>80, avoid glare at night from under bed. Use as: Bedroom Night Light, Crib Under Light (Amber for Baby), Bedside, Stairs, Cabinets and Bathrooms. Motion Activated Passive Infrared (PIR) motion sensor light with automatic timer, automatically detected by human body in dark environments, sensor range:4m (13.1feet),100°. Power Saving You can set the continuous lighting time from 30 seconds to 6 minutes as your need. Lights up only when the bed light sensor detects your movement, and automatically turns off when you leave, further improving power efficiency and saving energy. 1. 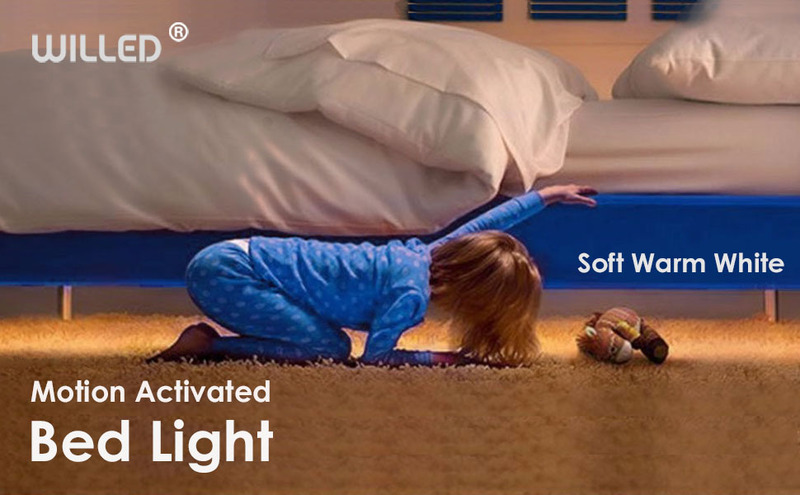 Warm soft glow of under bed light will auto turn on to guide you safely across the room in the dark, no disturbing glare to wake others. 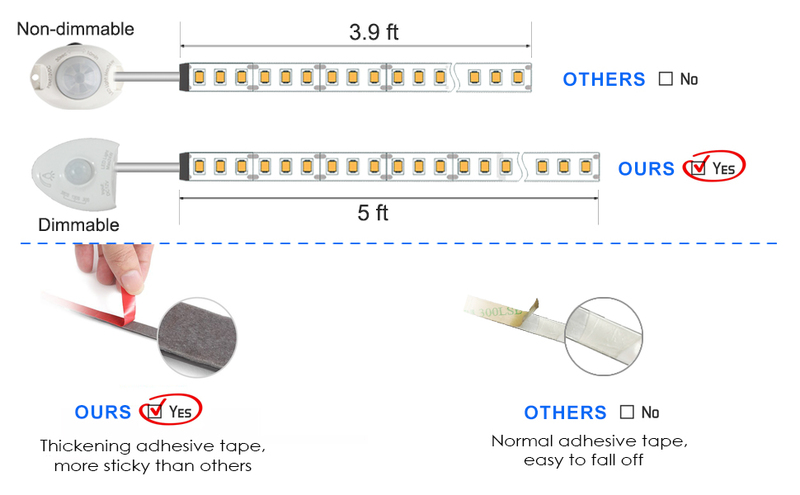 WILLED Bed Light with Super-strong 3M adhesive and unique super-flexible feature makes it easy to put wherever you want, for Baby Crib, Stairs, Cabinet, Bathroom, frames, doorways, or use as an under bed light.